Danielle Vella’s invention, Scooterpeg, is so innovative that she placed in the top 10 of Richard Branson’s business competition Pitch to Rich. She tells Veronica Stivala how she worked her way up. 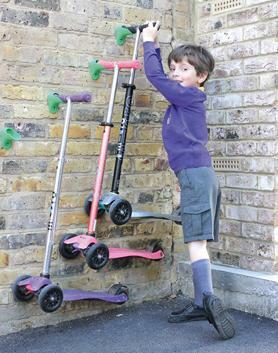 Danielle Vella’s son, Frank Izzo, aged five, hanging up a scooter at his school in Wimbledon, UK. The best ideas are sometimes the simplest. This is probably one of the reasons why Danielle Vella did so well in the Virgin Media Business Pitch to Rich competition this summer. Together with her business partner Rebecca Lalonde, Vella was one of the 10 semi-finalists with their product Scooterpeg. Their creation is just what it says on the box: a peg to keep scooters off the floor and out of the way. This simple but effective solution to the everyday problem of cluttered family hallways wowed the judges of the ‘New Things’ category. While Scooterpeg did not make it to the top three, it did incredibly well, especially considering there were a record-breaking 2,408 entries in the competition. Vella and Lalonde have known each other since childhood when they lived opposite each other and attended the same school in Bristol, UK. They lost touch but reunited some 25 years later through social media to discover they still had a lot in common. They were living only a mile apart, had young children of similar ages and both had a strong entrepreneurial streak. The idea for Scooterpeg came to them following a trip to Accident and Emergency for a badly sprained wrist as a result of tripping over a scooter in the hall. Fed up with the daily obstacle course of scooters, shoes, helmets, bags and balls, they wanted to find a solution to keeping the clutter out of the way. They thought, you can get a boot rack and a bike rack, so why not one for a scooter? The two decided to enter the Pitch to Rich competition in order to help give them a boost in starting up a new company. “We entered Pitch to Rich because we could use the extra funding to help us through the tricky first six months,” explains Vella. Pitch to Rich 2015 is a nationwide competition run by Virgin Media Business to find the country’s most exciting and innovative businesses. Virgin Media Business offers an unprecedented £1m business accelerator prize fund to support three winning businesses, whether it’s an idea, a promising start-up or a company with huge growth potential. The competition is an initiative to support small, growing UK businesses, which are the drivers of the national economy. This has included the introduction of specifically designed broadband services and the creation of free expert resources to help entrepreneurs make the most of the opportunities created by the digital world. Although Scooterpeg was their first invention, the two were not new to the entrepreneurial world. Lalonde has a background in new business development for creative agencies, delivering strategies to help create long-term, sustainable growth. Vella has a background in hospitality and has worked internationally as a New Store Opening and Training manager for casino and restaurant franchises, opening businesses in South Africa, Cyprus, Malta and the US. In Malta, Vella was part of a team of managers hired by Food Chain, a franchise operations subsidiary of Farsons, to open the TGI Fridays store. “We were a team of eight. I was the only woman and we spent six months living and training in the US at the TGIF head office,” she recalls. They worked in Cleveland, Ohio, Dallas, Texas and assisted in a new store opening in Chicago, Illinois. After returning to Malta and opening the store, she left to work in South Africa, assisting in the recruitment and training of all front of house staff in the Johannesburg and Pretoria TGIF stores. She eventually left South Africa to return to Malta and realise a personal dream of opening a family business. In May 2000, she opened Bloomers Brasserie in St Julian’s with her late father Kenneth Vella. Even though Vella grew up in the UK, her Maltese connections are strong, with relatives from both her parents’ sides living in Malta. Her father together with his father, owned and ran The Metropole Hotel in Sliema, which strengthens Vella’s hospitality background. She lived in Malta as an adult for some years before returning to the UK, but returns at least twice a year. Vella is hesitant to call herself an entrepreneur yet. “I believe you have to succeed to earn that title and we are still in the early stages of making our business work. I’m proud of how far we have got so far,” she says. Vella adds how there is a large gap between having an idea and actually translating it into a product and bringing it to market. She and her partner bridged that gap and overcame many challenges on the way. She acknowledges that the two are novices when it comes to product design, tool making, injection moulding, patenting and product protection, SEO and web design – however, they still made it this far. “The key is to find a business partner with different strengths and weaknesses to you so you complement each other,” says Vella. Scooterpeg is UK designed and made through Vella and Lalone’s company Class of 84 Limited and is currently patent pending. It will initially be available in four bright colours, with plans to expand the range to include more grown up shades, as well as further iterations such as a lockable version. As well as helping keep halls tidy, the product also works for nurseries, primary schools, and cafes in urban areas. For more information visit www.scooterpeg.co.uk.